In this activity, students will read a passage and identify details that appropriately complete the given webs. - SPI 0507.6.1 Distinguish among the planets according to their known characteristics such as appearance, location, composition, and apparent motion. 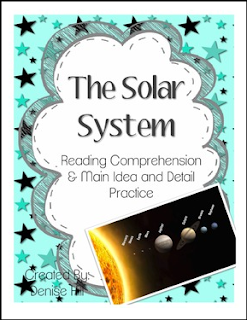 If you like this activity, make sure to check out other Non-Fiction Reading Comprehension Packs in my Store!